Last week I had the great honour of teaching a group of Farnham Girl Guides a 90 minute Pilates session. It was quite a nerve wracking experience getting up in front of teenage and pre teen girls, but I am never one to shy away from a challenge. I also believe passionately that getting girls into good habits around exercise, mindfulness and taking care of themselves from a young age is really important. During the session I talked about how important exercise is for confidence, their heart, enjoyment, team playing, meeting friends, the importance of a good bra for exercise (my daughter was mortified about this!) and posture. The class also covered balance, all body strength moves, core strengthening, spine mobility, flexibility of your back forward, back and sides, stretching and relaxation and how to learn to meditate! I couldn’t have asked for better praise at the end. They ran up after saying it was really cool which for any of you with teenage or pre teen children, you will know this is not said lightly! 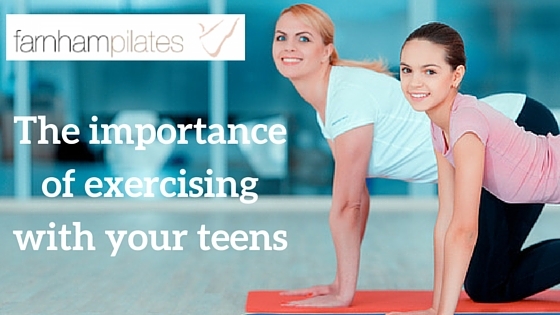 You can see that very quickly teens make really positive associations around exercise and the benefits it can have in their every day lives. The teenage years can be a time when our children start to give up some of the more active things they have always done for themselves. Pressures of school work and exams, social pressures and just changing bodies and hormones can all make it seem easier to just give up physical activities, maybe thinking you will pick them up again later. But it is so hard to get back to activities once you break away and breaking these good, healthy habits at around teenage years can set up a new habit that is harder to break – a cycle of not making time for yourself and your health and wellbeing. The whole experience got me thinking about how we can encourage our teens to keep active and do something that makes them feel good just for them. My conclusion is that we, parents, are the answer. I know it seems that at times our teens just want to do the opposite of what we are doing, but actually they take on board the positive. So seeing Mum or Dad regularly taking time for themselves, exercising and keeping healthy is a far greater role model for them than any ad campaign. If this is just a normal part of family life then it is more likely that your teen will continue taking care of themselves without even thinking about it. If you can also build activity into family occasions too then this can be a good positive reinforcement of healthy living. Even just a family dog walk, going bowling or we have become regulars at the roller disco since the New Year, or maybe taking time to do an online exercise video with your teen. These are all small, easy steps that can make a big difference to the ongoing health and wellbeing of your teen. So do you exercise as a family? And if so what do you do? And does your teen have a favourite activity that they do whatever? I would love to hear what works for your family. « Dry January! Why we need to drink more water!